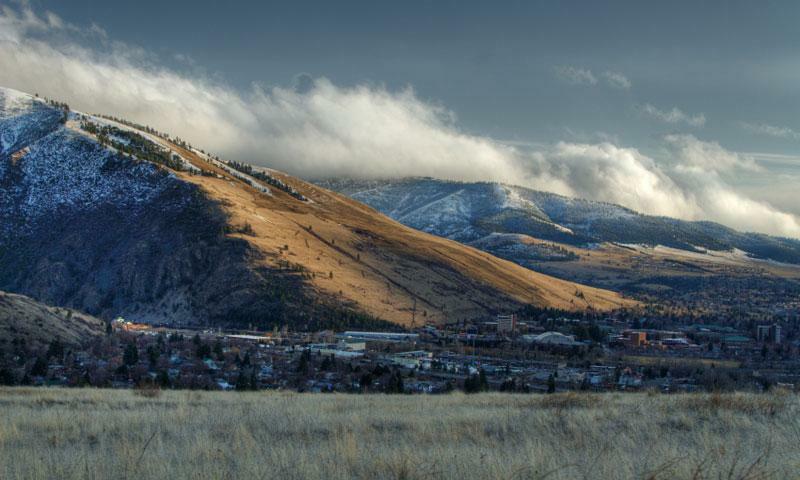 The Mount Sentinel Trail leads you to the best view of the Missoula Valley and its surrounding canyons, stop at the “M” or muscle through to the summit, you won't be disappointed. Steep, switch-backs with 620 ft elevation gain. Trailhead: Behind the University of Montana football stadium on Campus Drive. Breathtaking views from the “M” and the summit. The Mount Sentinel Trail, often referred to as the “M” trail, sits behind the University of Montana on its namesake, Mount Sentinel. It is the most used trail in Missoula. This short, but steep switch-back up the mountain can be a bit strenuous, but not unmanageable depending on your pace. Benches are provided every couple of switch-backs. A little under a mile from the trailhead you will reach the gigantic concrete “M,” a fixture in the community since 1908. From here the view is spectacular, but if you want to continue up the Mount Sentinel Trail to the summit, it is another mile up the mountain with fewer switchbacks. From the summit, the view stretches far and wide with Hellgate Canyon and the Rattlesnake Wilderness Area to the east, the Missoula Valley below and the Bitterroot Mountains to the south. The trail is frequented by a range of people. Not recommended for strollers. The trailhead is at the base of Mount Sentinel on Campus Drive. From I-90 west take the Van Buren exit and take a left. Take a right on E. Broadway and a left on Madison St. Cross the Madison St. Bridge, here Madison turns into Arthur Ave. Continue straight on Arthur for one block and take a left on 6th St E. Go straight until you dead end, it will look like you are driving into a parking lot. Take a left on S. Van Buren and then a right at the stop sign, Campus Dr. This will swing you behind campus, the trailhead will be on the left. Distance- 3/4 of a mile to the “M” or 1 and 3/4 of a mile to the summit. If you don't want to retrace your steps down the mountain, take the Crazy Canyon Trail into Pattee Canyon or the Hellgate Canyon Trail which links to the Kim Williams Trail taking you back into Missoula. Average Time of Hike- About 20 minutes to the “M” and an hour to the summit, one way. Difficulty- The Mount Sentinel Trail is mildly strenuous depending on fitness level. Trail Type- Out and back trail. Trailhead- Behind the University of Montana football stadium on Campus Drive. Mount Sentinel Trail is a quick day hike. In the summer it can be very hot, so make sure to bring enough water, the trail may be short but it is steep. In the winter, layers are key as mountain weather changes often. The trail does become slippery in the winter. If it is snowy, crampons are recommended on the trail, which has probably turned into a slab of ice from all the use.